China's 5A Donlord International Hotel is the epitome of luxury and splendor. It's warm environment and advanced facilities make it a hot spot for foreign tourists and Hong Kong movie stars coming to Guangzhou. 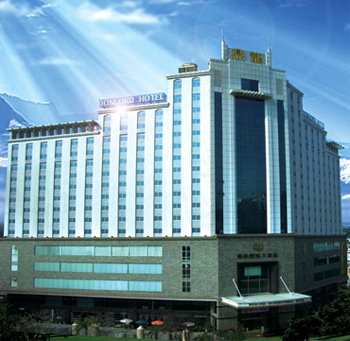 As the standard-bearer for all Guangzhou hotels, the Donlord earned the highest honor for luxury hotels in the province in 2005 and for the 3rd time received the China hotel starlight award in 2007. The hotel is home to 288 comfortable guest rooms equipped with the latest amenities. Some of these are divided into the administrative commerce floor and the no-smoking floor to provide a pleasant environment that will meet the needs of all kinds of guests. Four different modern conference rooms make it convenient for businessmen to have in-house seminars and meetings. The Dragon & Phoenix Restaurant is renowned for its delectable Cantonese cooking while the Four Seasons Café offers personalized choices for nutritious breakfasts, business lunches, or romantic dinners. All rooms are spacious comfort, separate shower, take a bath, equipped with high-speed broadband Internet interface, at 25 stories above the floor, scenery and pleasant.